first of all I wanted to thank and congratulate you guys for the development of the MultispeQ. I’m having a great time with the instrument and analysis software. To get more familiar with the measurements I started to follow the induction of senescence in young and old rhubarb leaves after flowering using the “Leaf Photosynthesis MultispeQ V1.0” protocol. 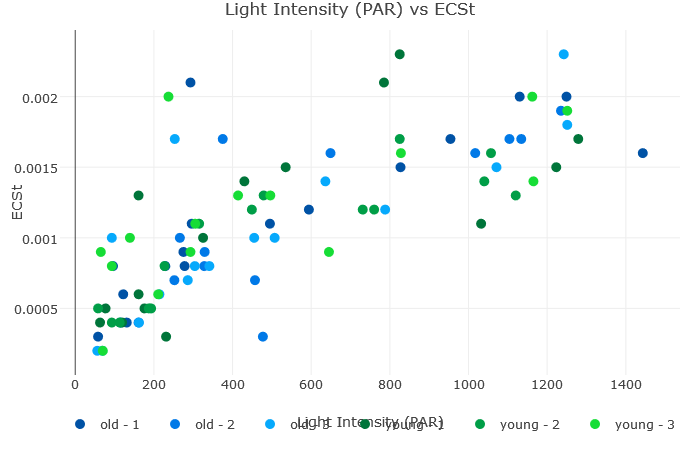 The first measurements in green leaves look promising and the PSII fluorescence parameters are fine, but I’m not so sure about the ECS parameters. I have attached some scatter plots for illustration. All measuring points were without the low or noisy ECS warning! 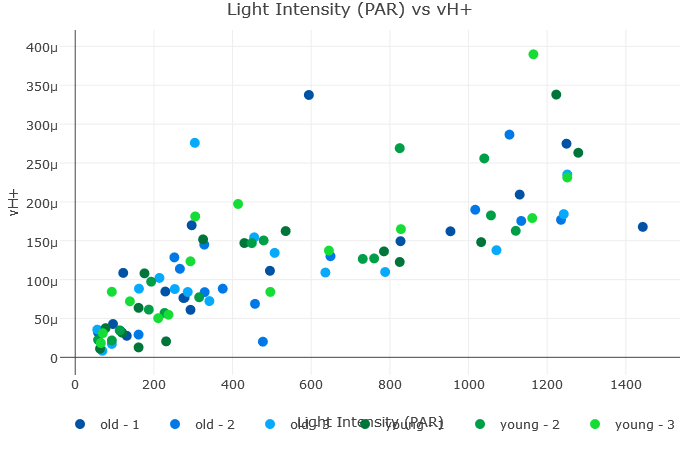 ECSt and vH+ are increasing with PAR and I think this is what I should expect, despite the large variation. 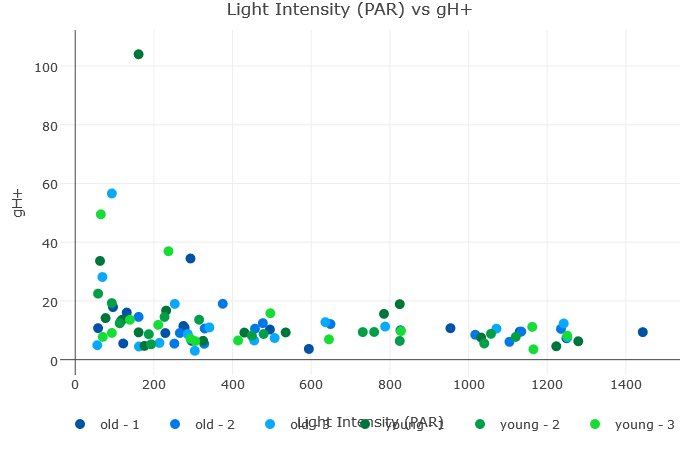 But gH+ seems rather low and not changing to PAR. I also got some very high gH+ values at very low light. Do you have any “expectation values” for gH+ in different species? Or can I conclude that I do something technically wrong (e.g. make sure to hold the device very stable/still while measuring)? Is there also a way to look at the raw trace of the ECS signal? Maybe I could decipher some more information from that. I can answer a few technical questions, but others are better suited to ask answer the plant physiological questions. The raw trace for ECS can be seen between 300 and 600 pulses (see attached image), but is very faint so you need to zoom in closely to see it. The method for determining ECS in the Leaf Photosynthesis MultispeQ v1.0 protocol has a couple of key constraints. 1. It uses a linear fit function that does not work properly under low light conditions, so you end up with a lot of '0' values. 2. It uses only a single measurement repeat so it is very sensitive to movement, so holding the device very stable is critical. 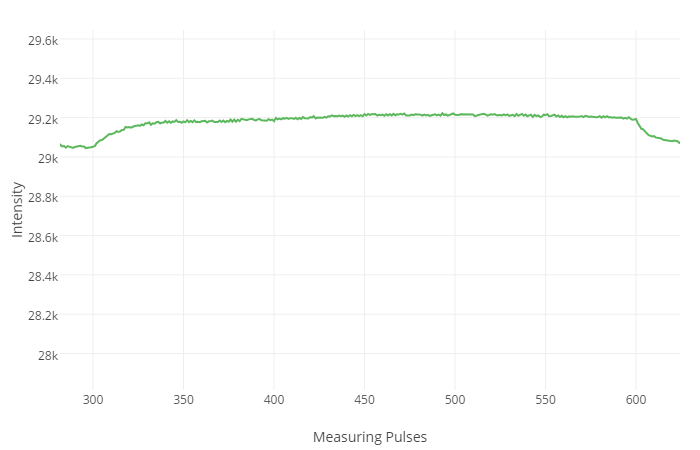 We are developing a new firmware version and protocol that will enable multiple repeats and non-linear curve fitting. Once released, these will overcome the current constraints and allow you to take highly accurate and rapid ECSt, gH+ and vH+ measurements. (1) The raw trace is transmittance and at 300 pulses light is turned off and transmission increases? I'm used to see difference absorption of the ECS signal and therefore decreasing when light is turned off. (2) What is the pulse frequency? The macro description states frist 1s for the pulse distance, but later on referes to µs. (3) Is the linear slope determined in the first 100 pulses (timepoints) after light off (so from 300 to 400)? (4) how is the initial slope for vH+ determined? Up to with pulse (timepoint) is the slope considered to be linear? I'm glad you like the MultispeQ and the PhotosynQ platform. I hope I can help you a little with your questions. (1) It is a little tricky here. You are correct, the raw trace is transmittance and when you turn off the light for the dark interval you see an increase. When it is shown in literature, you usually see the absorbance, where the signal goes the other way. We just calculate the absorbance from the transmittance, but we only show the raw data in the trace, so the transmittance. - We have a new protocol coming up that will have an improved way of measuring the ECS signal and a better way of presenting the data. (2) The frequency for the measuring pulses during the ECS measurement is 1000 us, so the dark interval is 300 ms. You can find the information when you look into the protocol instead of the macro. (3) As far as I know the data is linearized and then a linear fit is used instead of a non-linear. - The new protocol will use a different approach. (4) The initial slope is only using the first few points. I don't know how it is calculated in the macro.